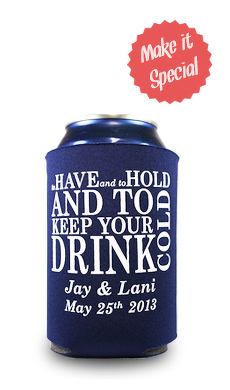 "To Have & 2 Hold, And To Keep Your Beer Cold"
Then the date quickly follows in an inverse print and the couples' names are listed below. With 25 koozie color options and 25 print options this alternative version of our To Have And To Hold And To Keep Your Beer Cold Koozie. Got our koozies yesterday! Very happy with the product and level of service! Will definitely recommend this company!